What is FRBR and how will it affect cataloging? Published as a report in 1998 by the International Federation of Library Associations and Institutions (IFLA), Functional Requirements for Bibliographic Records (FRBR) presented a new conceptual model of the bibliographic universe that takes into account the needs of users of bibliographic data. The FRBR model identifies and examines four tasks utilized by information seekers in discovering information. They are: find, identify, select, and obtain. The FRBR model is based on the entity-relationship analysis technique common in database design. It is highly theoretical, system-neutral, and code-neutral (i.e. not a set of cataloging rules). Entities (e.g. persons, works, concepts) are linked together by specific relationships. Entities and relationships are defined and identified by specific, prescribed attributes. Item — a single exemplar of a manifestation (Zhang & Salaba, 2009, p. 14). The Group 1 entities work and expression are abstract concepts, while manifestation and item reference physical objects. Group 2 entities include Person and Corporate Body, “agents who are responsible for the intellectual or artistic content, the physical production and dissemination, or the custodianship of any Group 1 entity (Zhang & Salaba, 2009, p. 17).” Group 3 entities are the subjects of works and include Concept, Object, Event, and Place. Group 1 and Group 2 entities may also be subjects of works. Illustrated below is a hierarchical view of the Group 1 entities and their relationships to each other which form the basis of the FRBR model. To illustrate the Group 1 entities and their relationships, the following example is provided. Maurice Sendak imagined a tale about a mischievous boy, who is sent to bed without his supper, sails to the land of the wild things, where he becomes their king. The abstract idea behind Mr. Sendak’s tale is the work that readers have come to know as Where the Wild Things Are. This tale can have multiple expressions in various languages. For example, the tale was originally published in English, but has since been translated (i.e. expressed) into other various languages (e.g. German, Finnish). 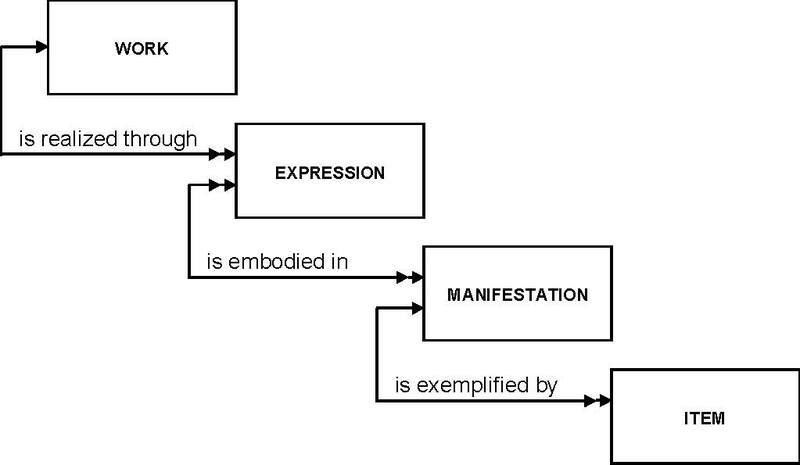 The manifestation of each expression of a work can be embodied in different formats (e.g. print, electronic, audio recording, etc.). For instance, Harper & Row originally published Where the Wild Things Are in English as a book in 1963 (making it a manifestation of the English language expression of Where the Wild Things Are), and the German translation was published in 1967 by Diogenes Verlag (this edition is a manifestation of the German expression of the work). A copy of a publication (i.e that which is sitting on a shelf, lying on a table, tucked in a bookbag, etc.) relates to the entity item in the FRBR model. Maxwell, Robert L. FRBR: A Guide for the Perplexed. Chicago: American Library Association, 2008. Zhang, Yin, and Athena Salaba. Implementing FRBR in Libraries: Key Issues and Future Directions. New York: Neal-Schuman, 2009.